Your Health Matters: Do you know how to spot a stroke? This probably isn’t what most people think about when the holidays come around, but a few years ago, my mom was at a holiday party with her coworkers, when one of them collapsed suddenly. He tried to decline treatment and go on with his day, but luckily there were people there who recognized the signs of a stroke and called 911 despite his protests. 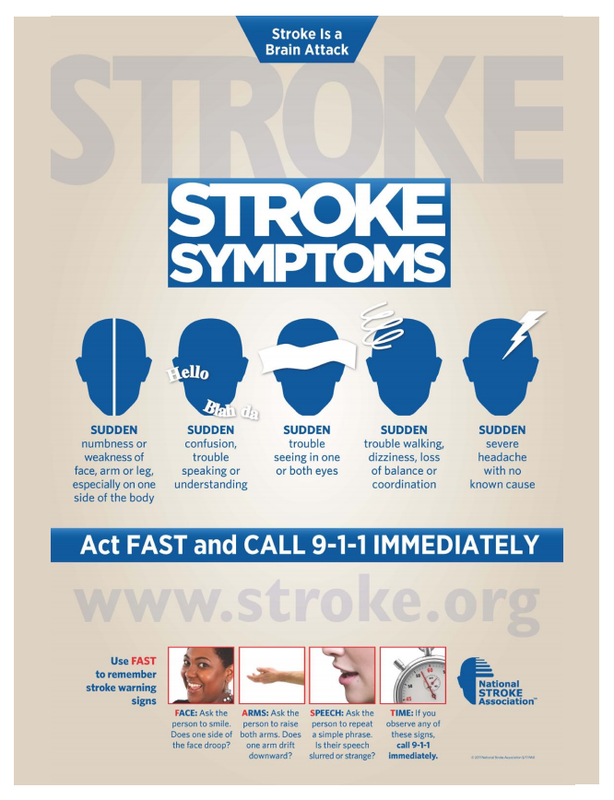 Thinking about that made me wonder – would I recognize the signs of a stroke and know to call 911 even if the victim said not to? So I did some research on the National Stroke Association’s website, and I found this acronym that can help you recognize the signs: FAST. F ­– Face. Does one side of the face droop when the person is asked to smile? A – Arms. Can the person raise both arms equally, or is one lower than the other? S – Speech. Can the person repeat simple phrases clearly, without slurring? T – Time. 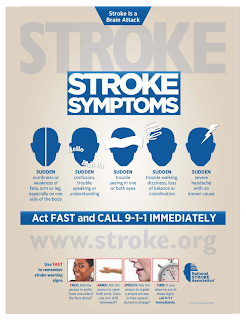 Time is critical when someone has a stroke. Call 911 immediately if someone exhibits these symptoms, and take note of when the symptoms appear. There is an FDA-approved clot-buster medication that can reduce the long-term effects of stroke, but only if taken within three hours. But what causes a stroke? Is there anything I can do to help prevent strokes? There are two main kinds of stroke – one where the blood vessel is blocked by a clot, called an ischemic stroke, and one where a blood vessel bursts, called a hemorrhagic stroke. So, basically, a stroke is caused by either a clot blocking an artery in the brain or an artery bursting. Either way, the end result is that the brain doesn’t get enough blood and brain cells start to die, which causes a loss in function. How can you help prevent either of those things from happening? Great question! checking with your doctor to see if you have any circulatory issues that could increase your risk of stroke. If you have any questions about your risk of stroke, make an appointment to see your doctor, ESPECIALLY if someone in your family has had a stroke.